“Maybe older people, like, really are different. You know? Like less fun inside.” With this realization, Finn the Human changes his world outlook forever, continuing the maturation process that began in last week's “Frost & Fire.” In this companion episode to season three’s “Too Young,” Finn tries to rebound with Princess Bubblegum after his break up with Flame Princess and learns that maybe age is more than just a number, but the road to that discovery passes through the Lemon-Earldom, a.k.a. the most obnoxious location in Ooo. “Too Old” has a much stronger overarching plot than the last Lemongrab-centric episode “All Your Fault,” but there are still multiple scenes this week that's grate on the nerves, particularly in the sound department. Half of this episode has the cloying aural quality of a crying baby combined with a hissing teapot, but the other half is a genuinely interesting look at developing political systems and adolescent relationships. 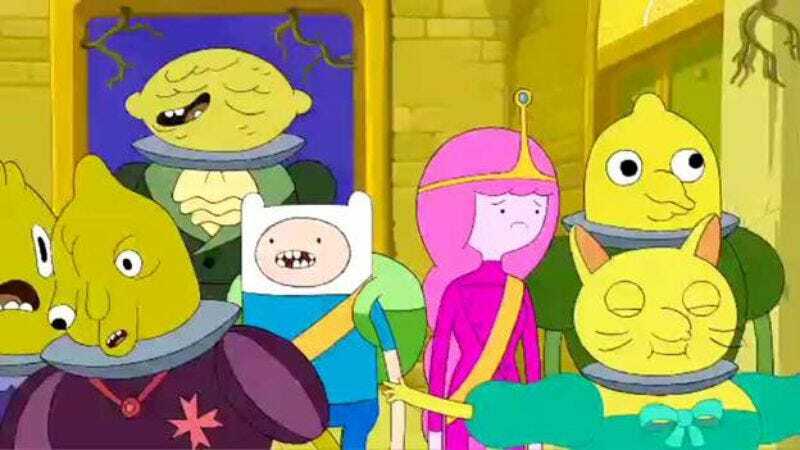 Finn takes advantage of a diplomatic dinner at Castle Lemongrab to rekindle his relationship with PB, but from the beginning, it's clear he's not mentally prepared for a mature romance. To start with, he lies to Jake when he’s asked if this is all just a plot to go on a date with PB, choosing to tell him that she just doesn't like him. He then lies to cover Jake's absence by telling PB that Jake doesn't like her, putting their friendship in jeopardy. When PB and Finn arrive in the Lemon-Earldom, they find themselves in the middle of a "sophisticated society," which has become a monarchy under the tyrannical rule of the overgrown Lemongrab 1. (Lemongrab 2 is by his side, wasting away in a hoverchair after being partially digested in “Another Five More Short Graybles.”) The earldom crumbles as its ruler refuses to let people share and forces his subjects to put on nonsensical floor shows, but there's one person who has the potential to save them all. Too bad he's locked away in Lemongrab 1's bathroom. Badlemon Nohope is a child prodigy harpist who sings of a better world that is a far cry from the lonely suffering of his jailer’s rule. Lemonhope is a voice of dissent who has the ability to unite the public under new ideology, so there's no way Lemongrab 1 is going to let him go. PB wants to bring the brilliant and sensitive soul to the Candy Kingdom, so Finn suggests that they prank Lemongrab 1 to impress him and earn Lemonhope as a reward. He says it will be just like old times when 13-year-old PB and Finn pranked Lemongrab in “Too Young,” and PB goes along with it because it works with her secret plan. Finn’s prank of putting up bakin’ soder and vina-gurt in Lemongrab 1’s soup doesn't impress him. It infuriates him, and he throws them into the dungeon, which is luckily the place PB wants to get to all along. Lemonhope can play a beautiful tune on Finn’s flutes to force Lemongrab 1 to open the dungeon door to smash the instrument, but the horrible non-melody of the off-key notes that emanate from the broken flute is perfect dancing music for Lemongrabs. While Lemongrab 1 busts a move, Lemongrab 2 sacrifices himself so that Lemonhope can escape and grow. 2 is slurped down by 1 after opening the dungeon, but claws his way out so he can make one last effort to save the Earldom. He tells the people, “Lemon need not squeeze lemon to survive,” and these words encourage the Lemons to join together and lift PB, Finn, and Lemonhope over the castle walls. There is a sociopolitical revolution brewing in the Lemon-Earldom, and Lemonhope’s education in the candy kingdom will make him an ideal leader when he gets older. During the escape, PB berates Finn for wanting to play his little boy games instead of taking responsibility in serious situations, a fact of adult life he isn't able to deal with yet. 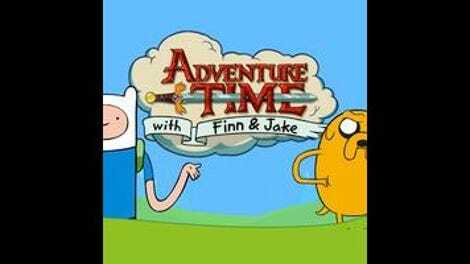 On the way home, he calls Jake to tell him what he learned about life getting less fun as people get older, but rather than accepting the responsibilities of age to become more attractive to PB, Finn immediately wants to go back to his stagnant relationship with Flame Princess. So what if it means denying himself intimacy? As long as Finn doesn't have to grow up, it's the preferable relationship choice. Jake jokes that FP already has a boyfriend, but I wouldn't be surprised if that's the truth when we see her next. Unlike Finn, FP seems ready to mature, and finding a partner that she can actually touch will help that process. As much as Finn doesn't want to grow up, it’s an inevitability of life, and a big challenge for both him and the series will be maintaining that sense of adventure as the character is faced with some harsh realities. Granted, those are the harsh realities of a fantasy world where anything is possible, so it's not going to be that hard for Finn to have fun even as he approaches adulthood. He's just going to have to make some changes if he doesn't want to live the rest of his life alone. BMO trying to get into the tub with Jake is so adorable. A hilarious visual detail of Castle Lemongrab: Lemons use the bathroom by juicing themselves on the toilet. “I think the Lemongrabs are getting weirder.” Their designs are definitely getting a cooler and more varied.